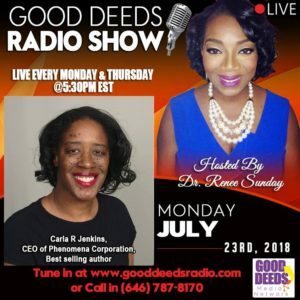 Check out my July 23, 2018 Good Deeds Radio interview with Dr. Renee Sunday! I talk about social media, personal branding and project management. I am delighted that she called me a powerhouse and that she reads www.carlarjenkins.com and watches me on LinkedIn (As I have said on numerous occasions someone is always watching). Like my content? Sign up for my mailing list below.